Jeremy Libby was born May 17, 1979 in Dover-Foxcroft, ME. He works as an independent living specialist at Alpha One’s office in Bangor, ME. LIBBY: You know, we have this unfortunate expectation as culture that when you experience a significant injury, you kind of sign out from society, and at fifteen, I hadn’t even signed in yet, you know I still hadn’t figured out what I was going to do at all, and so to have your entire future feel like it was just burned to the ground by an injury and then try and find a way to just live with that. No one, I think especially no fifteen year old wants to just sit home all day and do nothing. You have dreams for your future, you have aspirations. NARR: Jeremy Libby grew up in Pittsfield, Maine and counted the days until he could get out of his home town. He was the town troublemaker. He wanted to travel the globe and become an artist. LIBBY: Growing up in Pittsfield, I very much wanted to get out, you know, I wanted to experience the world. When I was a freshman in high school, I was fortunate enough to be able to take a trip to Russia that the school sponsored for a week, and that really opened my eyes to a lot of possibilities. My intent was to finish high school, and go on to an art school or design school. So that’s what I wanted to do. NARR: What happened instead, meant Jeremy would be very limited with where he could go, what he could do, and his ability to make art. LIBBY: I suffered my spinal cord injury when I was fifteen years old, during the summer. It was August 3rd, 1994. I was crowd surfing at a rock concert and fell and broke my neck. So I missed my entire sophomore year of high school. I was in rehab, physical rehab for six months, and then after I returned home, I continued rehabilitation at home. The initial year of my injury, for most of it I couldn’t even sit up straight, you know. It was a long rehabilitation process to get myself where I was stable enough to even go out into the community, let alone think about school and following up on those kinds of very practical things. NARR: At an age where adolescents are gaining new freedoms–driving cars, applying to college, dating – Jeremy was being told that those things would either be put on hold or impossible. LIBBY: You know, one of the emotional things you deal with after a really devastating injury is a lot of grief. And especially being a teenager, up until the point I was injured, I had an idea of what I wanted to become, an idea of what I wanted to do with my life, and at the time I felt like the injury robbed me of all of that possibility. And it was very hard to come to terms with that, come to terms with a new identity and a new set of possibilities that I didn’t like. NARR: His doctors gave him a long list of things he could not do. LIBBY: After my injury it was a barrage of things I could no longer do–you can’t walk, you can’t move your hands. That means you can’t go back and play soccer. My whole world, at least for the first year of my injury, was coming to terms with things I can’t do, and maybe will never do again. NARR: Slowly that started to change. NARR: Over time, Jeremy built a strong support system, attended college, got a job, and got married. He was gradually checking things off a long list of things he could still do. LIBBY: You know, I think it was really a ten-year process from 1994 to 2004 when I graduated from school that I really, it was that entire period that I was finding–I was slowly figuring out who I was and what I could do, and what I wanted to do with my life. And throughout that process, you know, pushing the boundaries of what I thought was possible, and what–some of the perceptions of what was possible that were given to me by doctors initially who just gave me that long list of things that I wouldn’t be able to do, and discovering that there were actually lots of things on that list that I could do with just a little modification to my environment, maybe help from someone else. And as I started to overcome those obstacles and move past those boundaries, I find myself enjoying a little bit more freedom. And that over time snowballed. It became a lot more freedom and a lot more ability, and a lot more doors that were opening up for me. 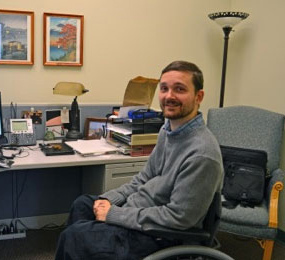 NARR: About five years after his injury, Jeremy learned about the disability rights movement. LIBBY: As I came into my own, as I moved into the community after school, as I began to work in the nonprofit field I started to learn a lot about what’s gone on historically in the legislature and on the national level and in communities to try and make not only I think building accessibility a priority but really to open up our environment to people with disabilities with the recognition that just because someone has a physical impairment that doesn’t mean they do not have something of value to add to society. I was learning about the disability movement at about the same time I was trying to force my way into the world and show that I had something to contribute. NARR: The Americans with Disabilities Act was passed in 1990 after many years and much opposition. Jeremy says that people aren’t aware of the ADA until they need the ADA. Which is why it continues to be an overlooked, under-enforced and misunderstood law. Jeremy explains that a cultural shift needed to occur for these changes to be made. NARR: I’m Keith Ludden. This segment in our series on the 25th anniversary of the Americans With Disabilities Act was recorded, written and produced by Molly Graham. Our series is funded in part by the Maine Humanities Council, in partnership with the Maine Arts Commission, Oral History and Folklife Research, Alpha One Independent Living Center, WMPG, and the Disability Rights Center of Maine.